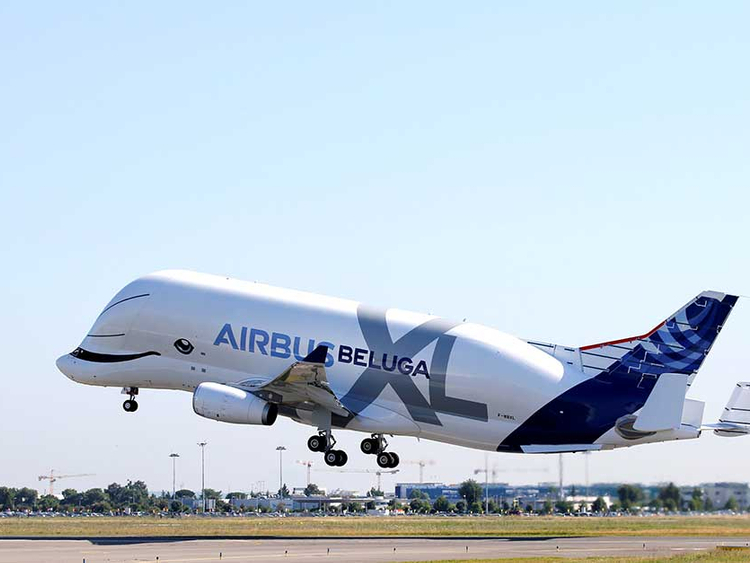 TOULOUSE, France: European aerospace giant Airbus conducted Thursday the first test flight of the giant new Beluga XL, an even bigger version of the company's workhorse transport plane which has been in service since the mid 1990s. Decorated for the occasion as a "whale in the sky", the plane's crew took off at exactly 10:30 am to a cheering crowd of 10,000 people at Airbus's facility in Toulouse, southern France. The A330-743L Beluga XL has grown six meters (20 feet) longer and one metre wider from the Beluga ST, stretching its carrying capacity by 30 per cent. Airbus says that at 19 metres tall the plane is as big as a three-storey house and can carry up to 51 tonnes of cargo, the equivalent of seven adult male elephants - though animals cannot be transported because the hold is not pressurised. The five planes being developed will be used to ferry around parts for building Airbus's other range of planes at its production sites across Europe. Two wings of the A350 long-haul passenger jet can now be carried, instead of just one previously, for a maximum distance of 4,000 kilometres.